Inspiration comes from many places and in this case inspiration came from another ‘inspired’ recipe. Our Mini Meatballs were originally inspired by cocktail ‘Swedish’ meatballs and now have their own inspired recipe, Beef and Mushrooms. 2. Drain the liquid from the meat, save the marinade as we’ll use it later. 3. Season the beef with salt, pepper then dredge in flour. 4. In 2 tbsp of olive oil and 1 tbsp bacon fat, cook the meat. 5. When the meat has browned, add the onions and Peperoncino Fiocchi (hot pepper flakes). When the onions begin to turn translucent add the diced garlic and cook until tender. 6. Once the garlic ‘just begins’ to brown, and add 1 cup of beef stock and 1 tbsp butter, let melt. 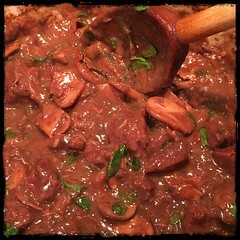 8. when it come so a simmer add 1 or 2 tbsp Zio’s Browning Sauce, the left over marinade and 2 bay leaves. 9. add the oregano and then let cook for at least 20-30 minutes (or until desired reduction is reached, the longer the better) adding salt and pepper (if needed, probably doesn’t). 10. Finish with some fresh cut flat-leaf parsley.